I found some cooling racks at the dollar store, and was compelled to make cupcakes. Here's the recipe, inspired by Epicurious and chockylit. In a bowl whisk together the flour, almonds, baking powder, and salt. In another bowl with an electric mixer cream together the butter and the sugar, beat in the egg and the almond extract. Then beat in the flour mixture alternately with the milk, beating well after each addition. Divide the batter among 12 paper-lined 1/2-cup muffin tins and bake the cupcakes for 15 to 20 minutes, or until a tester comes out clean. 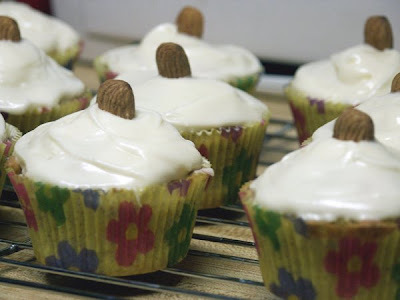 Turn the cupcakes out onto a rack and let them cool completely. Beat butter and cream cheese at medium speed until creamy. Add 1 cup of powdered sugar and honey until you get to the consistency and sweetness you like. Frost and garnish with a whole almond.